« Barter piglets for heifer? When I came home the other day, I couldn’t find Frank. Bjarki was tethered, Disa and Maggie loose, so I figured he was out running fence. He’s been doing it every spare moment he finds. So I asked them “where’s Daddy”? and the three of us went exploring. Maggie took the lead, headed off into the woods, through brush and brambles, in a completely different direction than I expected. I followed her, and then after a few minutes, I thought that I’m just being stupid to follow her, she didn’t know what I asked and we were just out for a stroll. When I tried to turn around to head back to the house, though, she stopped me and went back in her crazy direction, insisting I follow. Okay, then. Then the other morning, we headed down with a full tractor bucket of food to feed the pigs. Maggie was down there already, barking her head off at a brush pile. I wondered over to see what was up, and saw a huge bird, either a crow or raven. 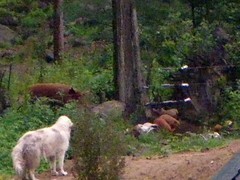 They often come down and wander around the pig paddock, and all of the dogs love to chase them away. Maggie looked at me as if to ask if it was okay to get this bird. (I’m often telling Buffy and Faith to stop chasing birds, damn it!) I told Maggie it was okay, to get it, and then watched her. She’s so good! Outsmarted a very cocky raven. I watched Maggie bite the head off and watch it thrash on the ground. Later that day, she drug it out in the middle of the drive-way to eat it in full view, relishing every bite. Those ravens would happily take a piglet, and Maggie knew it. 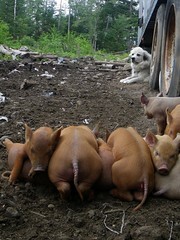 She likes the piglets. They are still afraid of her, but she’s so gentle around them. They are getting braver these days, starting to act like hooligans. They walk out right under the fence, run in circles, scream and shout, announcing to the world where they are, and in a place where their parents couldn’t help them if they got into trouble. They don’t go far, and they scramble back to Mommy all the time. Then wash, rinse, repeat. It’s fun! Maggie does NOT approve. She shows up wherever it happens, and tells the piglets that they WILL be going back behind the fence, thank you very much. She and I split those duties, enforcing the rule. “No piglets outside the fence.” But I love to watch her do it without my prompting. She’s such a good girl. This entry was posted in coyotes, Death, Dogs, Pigs. Bookmark the permalink. Post a comment or leave a trackback: Trackback URL. She really is something, one in a million.